BRADENTON, Fla. – ENCOURAGE: To give support, confidence or hope to someone. 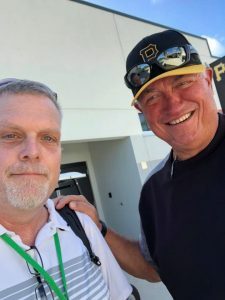 I met Clint Hurdle, the manager of the Pittsburgh Pirates, last season in Cincinnati. I was there to do some research on a project and snagged a few moments with him in his office before a game. We had a good chat about his testimony. Clint was accepted at Harvard University, and was offered a scholarship to play football and baseball at Miami University, but opted for the Major Leagues. Over his 44 years in the MLB as a player and coach, he’s been traded, released and fired. Clint has been all around the MLB. He played for the Kansas City Royals, the Cincinnati Reds, the New York Mets and the St. Louis Cardinals. He coached for the Colorado Rockies and the Texas Rangers before managing the Rockies and the Pittsburgh Pirates. In 2013, he was named the National League Manager of the Year with Pittsburgh, where he has been the past seven years. To be a professional baseball player and manager takes talent and has its ups and downs. Follow Del Duduit on Twitter here. Once Clint got his life lined up with God, the birdies and pars followed. Before I left the clubhouse, I gave Clint my card and thanked him for his time and openness. In 2009 he started sending a daily group text of encouragement to about 12 of his friends while he worked for Colorado. Two months into the season, he was fired. A few weeks later, he was on vacation when a person in the text strand sent him a message and asked how he was doing. He replied “okay.” The other person responded and said she was not okay because she had not received his messages of encouragement for six weeks. “You’d sign your texts with ‘Make a difference today. Love Clint,’ and you’re not making a difference, and I don’t think you love me,” the friend’s message boldly stated. The next day, Clint started to send the texts again. His messages now touch several thousand a day. I’m so glad I receive the texts from Clint. They encourage me. And, once in a while, I’ll send him a text to say “hi,” or “thank you.” He always responds. 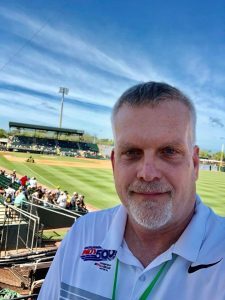 A few weeks ago, before I met up with him in Bradenton at a spring training game, I sent a note letting him know I’d like to say hello when I stopped by. We had a nice conversation, and it was good to connect with him in person again. I’ll be seeing him and his Pirates a few more times during the season this year. I look forward to our talks, and I am always grateful for his daily messages. No matter what you have been through in life, you can inspire others and be a witness for God, like Clint does. He is a constant encourager and is not shy about his devotion to his team and his Savior. I’m thankful for a Savior, and I’m thankful I have not had to trod through a Christian obstacle course like Clint has done. But I am grateful for his witness and his willingness to portray the Master in such a transparent way. When I face a trial, I’ll try to handle it like Clint does and demonstrate the love of the Lord. I’m also thankful I have a friend in Pittsburgh who sends me words of encouragement around 6:30 a.m. every day. That means a lot to me. Clint has inspired me to do better. He does it with his platform as an MLB manager and with his emails and text messages. I try to encourage or inspire with my blog posts and my soon-to-be-released books. What can you do to encourage? What can you do to inspire? How do you share the love of Christ? Del Duduit is the Editor of Southern Ohio Christian Voice. He is an award-winning writer, freelancer, blogger, speaker, and author of Buckeye Believer: 40 Days of Devotions for the Ohio State Faithful. (http://bit.ly/BuckeyeBeliever). He lives in Lucasville, Ohio with his wife, Angie, and they attend Rubyville Community Church. He is represented by Cyle Young of Hartline Literary Agency. Tampa Christian Voice is a local media hub for Christian news, entertainment, events and inspiration for the Tampa Bay area. Please contact us with news and information to share with the community.